(AFP) - The party of exiled former Maldives president Mohamad Nasheed has won the country's first outright majority in parliament in its democratic history, officials results showed Wednesday. The final count released by the Election Commission shows Nasheed's Maldivian Democratic Party (MDP) won 65 of the 87 seats in parliament in elections held Saturday -- a more than two-thirds majority. His party will rule without needed to form a coalition, an unprecedented election outcome for the Indian Ocean archipelago nation. The MDP's closest rivals, the Jamhooree Party and Progressive Party of the Maldives, both won five seats. Two minor parties and independents secured 12 seats among them. Nasheed -- who until five months ago was still in exile -- has vowed to use his party's thumping mandate to usher in a new era of stability and democracy in the Maldives. The holiday destination popular with honeymooners is only just emerging from years of strongman rule, political crises and corruption scandals miring the government and judiciary. Nasheed's comprehensive victory was another rebuke for his rival Abdulla Yameen, who was dumped as president in a shock election defeat in September under a cloud of corruption and embezzlement allegations. Yameen did not run but his party -- the Progressive Party of Maldives –- only collective five seats. 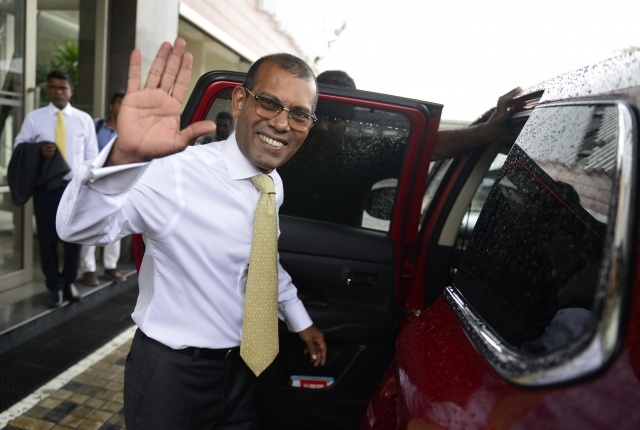 Nasheed returned to the Maldives in November after the Supreme Court quashed a terrorism conviction against him.